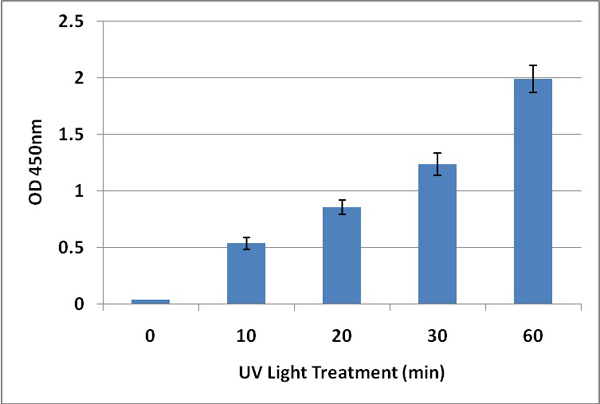 CPD ELISA for Isolated DNA | Cell Biolabs, Inc.
Our OxiSelect™ UV-Induced DNA Damage ELISA Kit measures the formation of cyclobutane pyrimidine dimers (CPD) in DNA isolated from cells or tissues. Standards or unknown DNA samples are first heat denatured before adsorbed onto a 96-well DNA binding plate. The sample or standard are then probed with an anti-CPD antibody, followed by an HRP conjugated secondary antibody. Cui, H. et al. (2016). The Stress-responsive Gene ATF3 mediates dichotomous UV responses by regulating the Tip60 and p53 proteins. J Biol Chem. 291:10847-10857. Rimann, M. et al. (2015). Standardized 3D bioprinting of soft tissue models with human primary cells. J Lab Autom. doi:10.1177/2211068214567146. Donninger, H. et al. (2015). The RASSF1A tumor suppressor regulates XPA-mediated DNA repair. Mol Cell Biol. 35:277-287. Zirkin, S. et al. (2013). The PIM-2 Kinase Is an Essential Component of the Ultraviolet Damage Response That Acts Upstream to E2F-1 and ATM. J. Biol. Chem. 288:21770-21789 (#STA-322). Burgess, H.M. et al. (2011). Nuclear Relocalisation of Cytoplasmic poly(A)-binding Proteins PABP1 and PABP4 in Response to UV Irradiation Reveals mRNA-dependent Export of Metazoan PABPs. J. Cell Sci. 124:3344-3355 (#STA-322).